Cereal Killa Duchess Review - Best of Both Worlds! - Daily Vaping Deals & The Best Vape Product Reviews at Vaping Cheap! Home → E-Juice → Cereal Killa Duchess Review – Best of Both Worlds! Cereal Killa Duchess Review – Best of Both Worlds! Cereal Killa by 9South Vapes and Duchess by King’s Crest are two of the most popular e-liquids on the market today, and for good reason! These two companies came together to bring one new and unique flavor by combining the flavor profiles from these two popular e-liquids! Cereal Killa Duchess is available in a 100ml bottle size, and it does come in a Chubby Gorilla Bottle. In addition, it is offered in nicotine strengths 0mg, 3mg and 6mg. Before getting any further into this e-liquid review, we’d like to thank Fuggin Vapor for sending this ejuice our way for the purposes of this review. We’ll cover our overall thoughts on Cereal Killa Duchess and conclude with whether or not we recommend it! Remember, taste is subjective so what we may like you may not like and what you like we may not like. Next, we will go over the specific atomizers and mods used to test this vape juice. 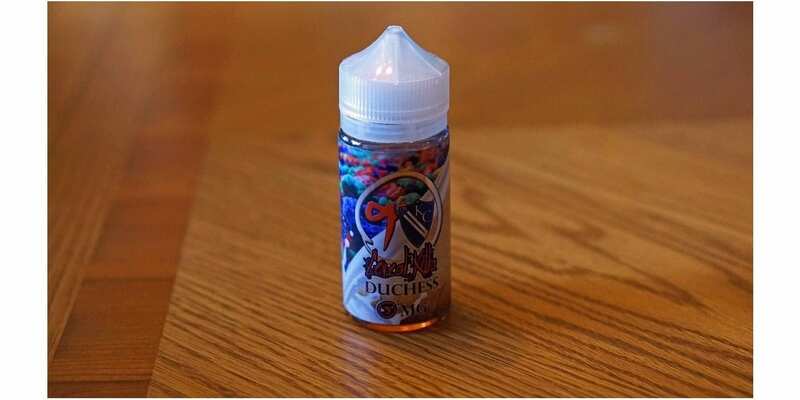 Click Here to Check Out Cereal Killa Duchess 100ml! Flavor Description: 9South Vapes and Kings Crest E-Liquid teamed up to combine their two most popular flavors- Cereal Killa and Duchess together into one deluxe 100ml bottle. This Tres Leches Cake topped with Fruity Cereal takes both flavors to new levels!!! Cereal Killa by 9South Vapes was the first cereal vape I’ve ever tried, and there was always something about it that made it taste just a bit different than the rest. Honestly, I haven’t had this e-liquid in some time, and vaping this new version did bring back some old memories! With that being said, on the inhale, you get a fruit cereal flavor. On the exhale, you get the same fruit cereal vape up front and as you exhale, you do get background notes of Tres Leches Cake. Honestly, I’m quite impressed with how they pulled these two flavors together into one. It’s definitely unique, and you taste the best of both worlds. The fruit cereal flavor is definitely the most dominant throughout the entire vape experience, but you can certainly taste the Tres Leches Cake in the background. At the end of the exhale, the cake flavor is more noticeable, and you’re left wanting more. Cereal Killa Duchess is a on the sweeter side, but I personally enjoy sweeter e-liquids. In addition, it’s not the friendliest to your coils, but it’s not the worst I’ve had. It’s to be expected though since it is sweet, but I didn’t mind having to change out cotton since this is really good. I’m not sure of the VG/PG ratio on this one, but it looks to be either 70VG/30PG or 75VG/25PG. Regardless, the vapor production is great. The throat hit is a bit more throaty for me since I primarily vape 1.5mg, but it does calm down after taking a few vapes. All in all, Cereal Killa Duchess is a home run and definitely an all day vape. It’s amazing how these two flavors are meshed together to bring forth one new and unique vape. If you’re a fan of cereal flavors, or either one of the originals, then I do highly recommend picking up a bottle of this vape juice. You won’t be disappointed!